Thirsty Californians living in Sand City began satiating their thirst with Pacific Ocean water starting this week, following the official launch of the state's first full-scale seawater desalination plant. The city hopes to ensure that people won't notice any difference in quality or taste compared from the reservoir water that usually comes out of their taps, according to Scientific American. The brackish water treatment plant is expected to provide up to 98 million gallons (370 million liters) of drinking water per year, and cut down on that amount of water drawn from the Carmel River and Seaside Aquifer reservoirs. Desalination works in this case by forcing seawater through a semipermeable membrane to separate out the salt. The $11.9 million plant operated on a test basis for more than a year, but only recently received permission from the California Department of Public Health to connect directly to the water grid serving the Monterey Peninsula. Sand City has the good fortune to sit near a brackish coastal area where water is less salty than typical seawater -- and that means less energy and costs to desalinate. The city plant also uses reverse osmosis as its method of choice, rather than more expensive distillation which involves evaporating the water to separate it out from the salt. The plant takes two additional steps to reduce its impact on marine life and to boost energy efficiency. First, it adds a special solution to the leftover salty brine that matches the salinity of Monterey Bay. And second, it uses special rotors to recover 98 percent of energy from the flow of salty concentrate, and puts that energy toward pumping seawater through the reverse osmosis membrane. 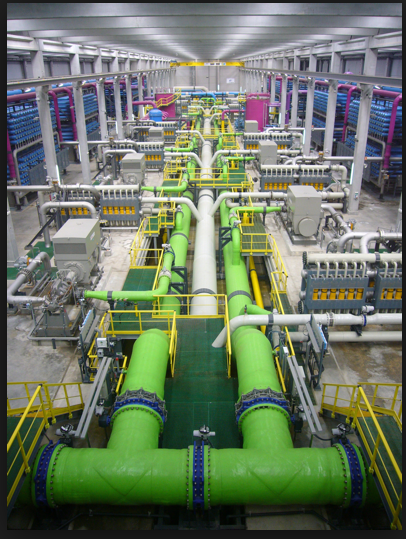 Desalination has become more and more attractive as a thirsty world looks for new freshwater sources. There's even a mini-sized desalination chip designed by MIT researchers that could provide drinking water for remote villages in the wake of disasters. IBM researchers and scientists at Saudi Arabia's national research organization have also been working on water filtering technology that could create a breakthrough in solar-powered seawater desalination. Considering that an estimated 1.2 billion people still lack access to safe drinking water, we'll take what we can get. Sand City Coastal Desalination Plant is the first full-scale seawater desalination facility in the state of California. It is capable of producing 300 acre-ft of water (98 million gallons approximately) a year and uses reverse osmosis (RO) process to desalinate brackish seawater. The plant became operational in April 2010. The official opening ceremony was held in May 2010. Funding for the $11.9m project came from two sources. An amount of $2.9m was provided by the California Department of Water Resources through Proposition 50 Grant funding and the remaining $9m was covered by the city itself through redevelopment funds and city capital improvement funds. Sand City located in Monterey County, California is a small city with just a few hundred permanent residents. It is a popular shopping and tourist destination with almost 40,000 people visiting every day. The new plant has been built with the aim of providing the city with a long-term water supply. Before the commissioning of this plant, the city used to purchase 100% of their water from CalAm. "The new plant is owned by the Sand City and is being operated by CalAm." Sand City had limited water resources and regional efforts to deal with this situation had not produced good results for more than 20 years due to financial and political reasons. The city therefore decided to build a desalination plant on its own in cooperation with California American Water (CalAm), the region's public water utility. The project for providing the city with a source of potable water had been in the pipeline since the late 1990's. The Environmental Impact Report (EIR) for the project was completed and certified in January 2005. In May 2005, the coastal development permit was unanimously approved by the California Coastal Commission. The city received $2.9m in Proposition 50 Grant funding from the Department of Water Resources in June 2007. The plant is designed in such a way that there are no adverse environmental effects to coastal resources, including marine organisms, groundwater supplies and sensitive habitat areas. Chemical composition of the concentrate produced as a result of the treatment will be very similar to that of original sea water. As a result, its injection in a below sea-level horizontal well beneath the coastal bluff is not expected to substantially change the existing seawater / freshwater interface. It will also not increase salinity in the Bay. "The plant is designed in such a way that there are no adverse environmental effects to coastal resources." The facility includes four brackish water feed wells, a concentrate disposal well and associated pipelines and components. Of the four wells that are used to pump sea water to the plant, two are in use at any given time. These are over 18m deep and located 61m from the surf line and over 760m from the plant. Size of the feed pumps was reduced by more than 60% by using energy recovery devices. This will reduce the long-term operating cost and improve the overall plant efficiency. The plant has a single-rack RO skid design with four separate columns of pressure vessels. The configuration reduced the footprint and interconnection piping. The façade of the plant was designed by David Martin & Associates. Construction began in March 2008 with four extraction water wells, pipelines and the treatment facility. Drilling of the brine discharge well and feed wells, and pipeline laying works were completed by the end of 2008. By the end of March 2009, the treatment facility building shell and parking lot were completed, all internal RO equipment, pumps and piping within the facility were installed, and final testing of the facility and system were initiated. The project also involved construction of a tunnel and installation of associated pipeline beneath State Highway 1. The supplied sea water is first filtered through cartridge filters followed by single-stage reverse osmosis membranes which have been designated to receive 2-log (99%) removal credits. The resultant water is then disinfected using ultraviolet (UV) disinfection to achieve an additional 3-log (99.9%) inactivation of Cryptosporidium and Giardia. In order to achieve an additional 4-log (99.99%) virus inactivation, the UV disinfected water is then chlorinated and stabilised with the existing distribution system water by blending carbon dioxide, a calcite contactor and caustic soda. The new plant is owned by the Sand City and is being operated by CalAm. Design-build contract of the plant was awarded to CDM Constructors. Apart from installing four seawater intake wells and twin 10" PVC Pipelines, MGE Underground carried out jack and bore of State Highway 1, joint trench construction, repaving and beach access work. Creegan + D'Angelo Engineers Prepared the preliminary design documentation. The pressure exchanger was supplied by Energy Recovery. The $11.9m plant became operational in April 2010. Energy recovery devices cut the energy requirement of the facility by 60%. All internal RO equipment, pumps and piping within the facility were installed in March 2009. Sand City Coastal Desalination Plant is California's first full-scale seawater desalination facility. The plant has a single-rack RO skid design with four separate columns of pressure vessels. 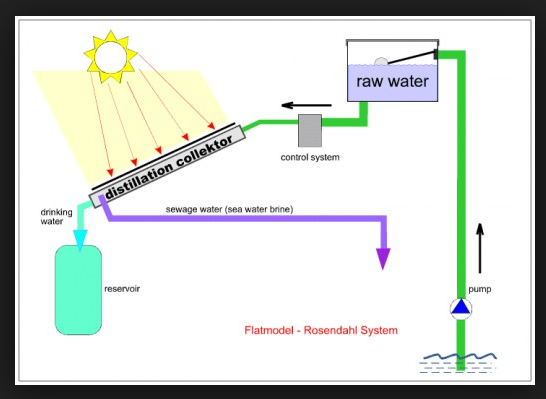 The plant uses reverse osmosis (RO) process to desalinate brackish seawater.